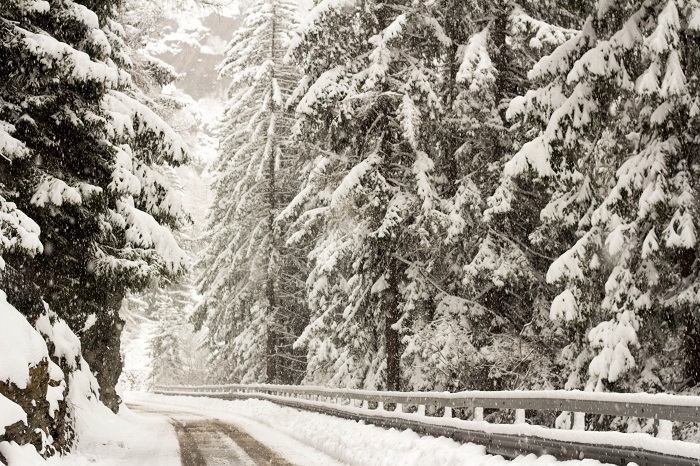 But it isn’t spring in my Alpine wonderland of Valle d’Aosta, Italy. 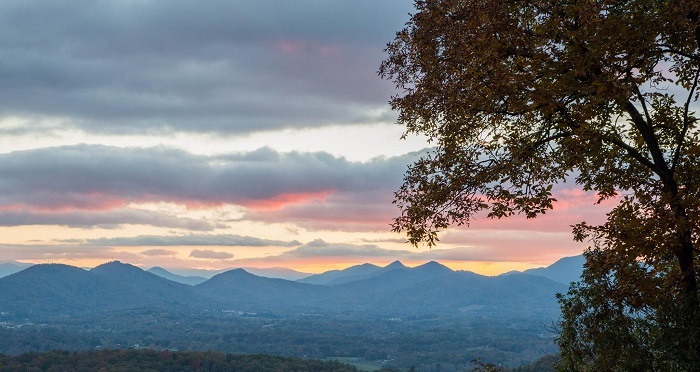 Instead I’m watching the world come to life in the mountains where I was born, in Asheville, North Carolina. A little more than a year ago, I moved back to the US. Gianluca followed about six months later. It was a move I didn’t think we would ever make; when I moved to Italy, I expected it to be for life. Life in Italy is glorious…there are adventures around every corner, it is breathtakingly beautiful, the people are kind and generous, and the food… it is just as good as you’d think. And the wine is even better. However, the Italian economy is in a downward spiral, and we joined the ranks of the countless people of my generation leaving the country in droves to find greener pastures. I miss Italy. Last month I went back for a visit, and I was overwhelmed with emotions when I was there. We have an unbelievably wonderful community there; my husband’s family is loving and supportive, and I couldn’t find better friends in a lifetime of searching. The valley is even more spectacularly beautiful than I remember… even if the roads are sometimes unexpectedly treacherous (a few weeks ago, I might have gotten stuck in a snowstorm on the side of a mountain, abandoned my car on a windy mountain road and hiked until I was rescued). But as much as I miss the country that adopted me, I am happy to be living in the United States. Life here is easy. Jobs exist for most well-educated people. The mailman picks mail up from your house (trust me, this is a big deal). You can directly vote for people to represent you in government. Taxes are insanely low, and they even give you money back after you file. It’s possible to buy a decent house in most places on an average person’s paycheck. These are things I forgot about, or put out of my mind. And let me tell you, they make a big difference. I love both of my countries. They have different strengths, and different flaws. But both of my ‘home towns’ have these things in common: they are quirky, isolated towns nestled in beautiful mountains, filled with kind and interesting people, with surprisingly similar (and delicious) food traditions. From my mountaintop perch near Asheville, I really appreciate where I live. 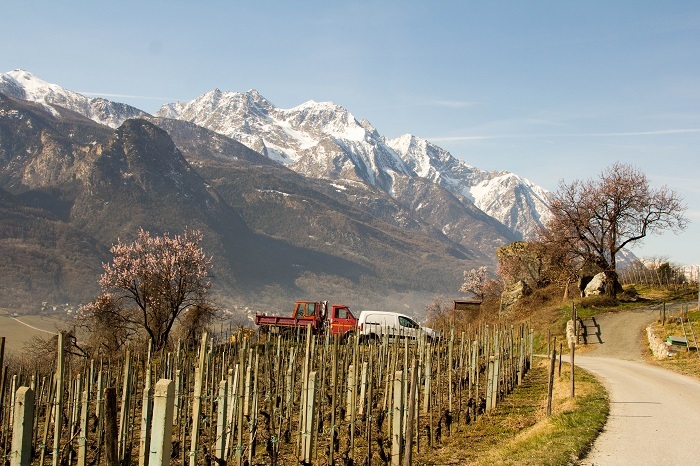 More on that part about similar food traditions… mountain food is mountain food. Corn, beans, meat, root vegetables, apples, greens. These are the staples of most mountain communities. In the Italian Alps, they have polenta, apple cake, and beans cooked with lardo, whereas in the Appalachian mountains we have cornmeal mush, apple pie, and beans cooked with fatback. Given that the ingredients (and recipes) are often similar, it is also easy to create recipes that fuse the two traditions. Much of what I cook is an Appalachian-Italian hybrid of some sort. Earlier this week, I went down to my neighborhood farm stand and I saw a sign that said ‘RAMPS!’ in large, bold letters. Sure enough, they had a pile of freshly pulled ramps, dirt still clinging to the roots. I promptly grabbed several bunches. 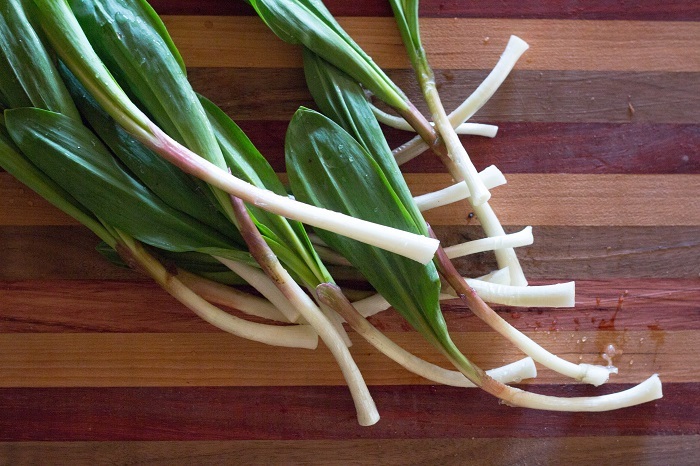 Ramps are so very special. They grow for a short window of time in early to mid April in my neck of the woods, and they are basically wild leeks. They have a delicate ‘leeky’ flavor that I missed all the years I lived in Italy. While they are simply spectacular cooked in cornbread, I couldn’t help but wonder what they would be like in risotto. My husband (a self-proclaimed risotto master. He is, trust me!) 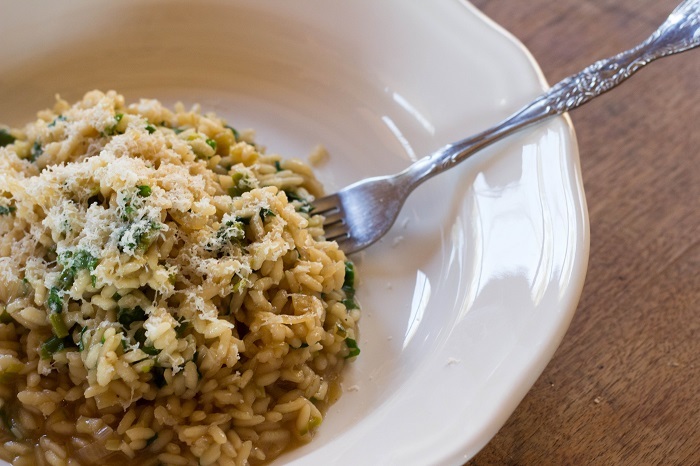 makes leek risotto all the time, so we figured ramp risotto would be a special treat indeed. Follow Gianluca’s instructions exactly and you won’t go wrong. Whatever you do, never stop stirring! You’ll want to stir gently, but constantly. First, get a nice big bunch of ramps, clean them, and trim the roots off. Chop them up, keeping the white and green parts in separate piles. 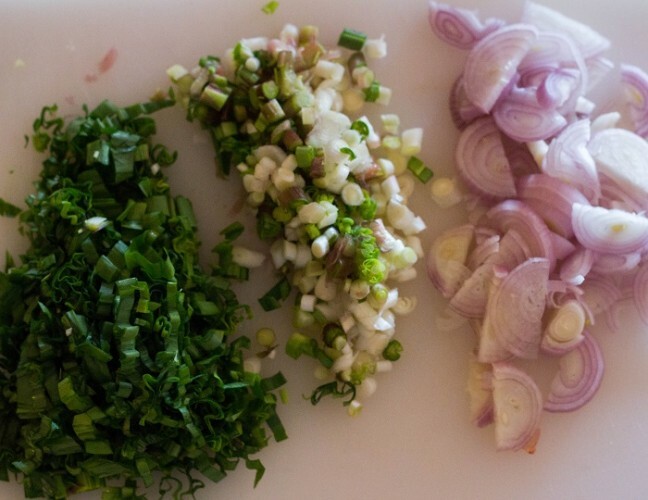 Chop up a shallot or two while you are at it. Heat up a pot of broth. You want to keep it warm the whole time you are making the risotto. Beef broth is best, vegetable is fine, but please don’t use chicken. Gianluca likes to make broth by putting a little Bovis in water. Bovis is similar to Marmite. Since that’s all we can get here in the US, that’s what we used (a couple teaspoons in a small pot of water should do it. Add until it tastes brothy). Here is a trick to figuring out how much rice to use: two big handfuls of rice per person, plus one or two handfuls for the pot. So for three people, we used 8 handfuls of rice. 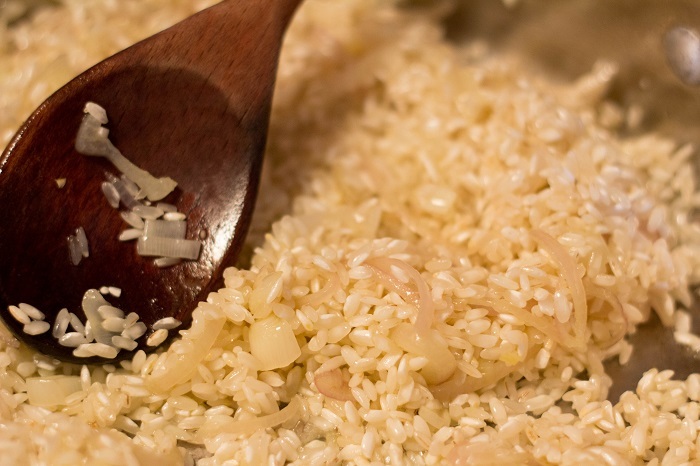 IMPORTANT: you cannot use just any rice; it must be short-grained Italian rice such as arborio or carnaroli. Carnaroli is difficult to find in the US, but you should be able to find arborio rice in most grocery stores. Using a shallow saucepan, melt a walnut-sized piece of butter with a splash of olive oil over medium heat. Saute the shallots until soft. Add the rice, raise heat up to medium-high and stir the rice constantly until the grains of rice begin to look semi transparent around the edges. Add a few glugs of a dry white wine, and reduce heat back to medium. The wine will make the rice begin to release its starch and it will take on a slightly creamy appearance. Add the white part of the ramps, and stir gently for a few minutes. Add a couple ladles of broth to almost cover the rice. Keep stirring, and add a ladle of broth when needed. You don’t want to drown the rice, but you want to keep it from drying out. 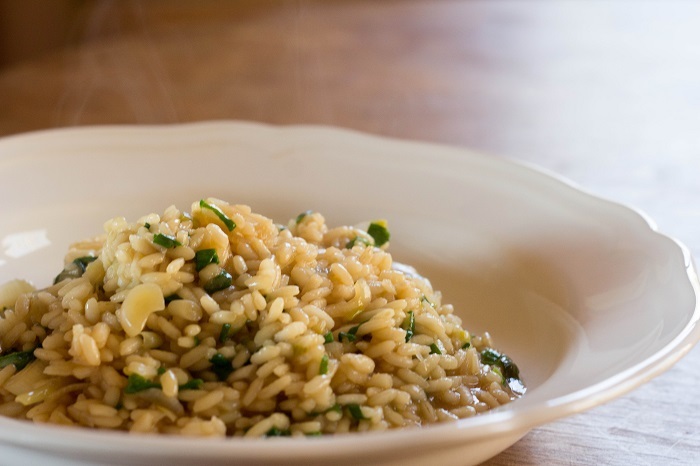 When the rice is almost done – done in this case means ‘al dente’, so a bit of a bite and not mushy at all – stir in the green part of the ramps, and then a walnut sized piece of butter. Adding butter at the end like this is called ‘mantecatura’ . Serve hot. Depending on your broth, it might have the right amount of salt or not enough. If you’d like it a little saltier, try sprinkling some flaked salt on the top. Adding a dusting of parmigiano is highly recommended! Eat immediately with the same wine you cooked with. 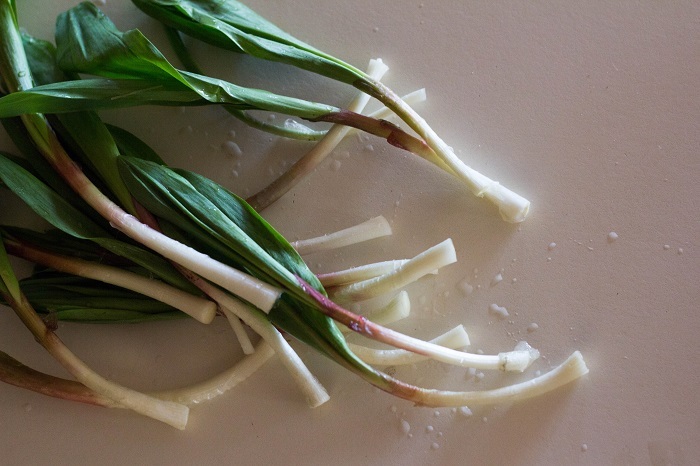 Finely chop the ramps, keeping the white and green parts separate. Using a shallow saucepan, melt a walnut-sized piece of butter with a splash of olive oil over medium heat. Saute the shallots until soft. Add the rice, raise heat up to medium-high and stir the rice constantly until the grains of rice begin to look semi transparent around the edges. Add a few glugs of a dry white wine, and reduce heat back to medium. Add the white part of the ramps, and stir gently for a few minutes. Add a couple ladles of broth to almost cover the rice. Keep stirring, and add a ladle of broth when needed. You don’t want to drown the rice, but you want to keep it from drying out. 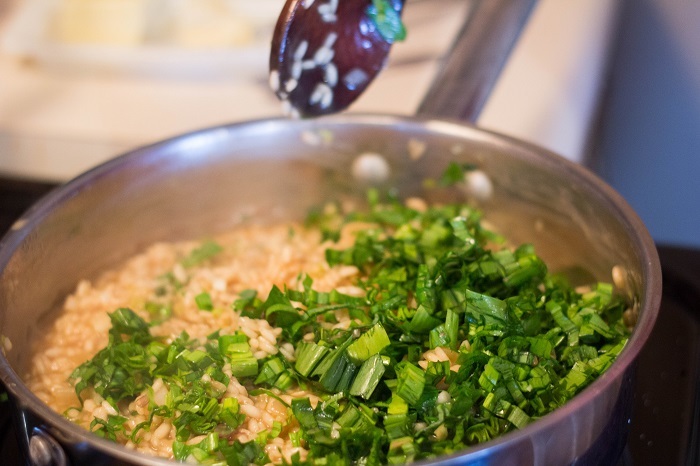 When the rice is almost done – done in this case means ‘al dente’, so a bit of a bite and not mushy at all – stir in the green part of the ramps, and then a walnut sized piece of butter. Serve hot. I just left a comment on your risotto recipe for fresh porcini mushrooms, unaware that you’ve moved back to the US. I’ll be looking forward to seeing your Italian-inspired American recipes! Best of luck back in Appalachia country.